It’s happy chaos at the moment chez paint chart joy as we have the plumbers in. Having leaked three times through the ceiling, it was definitely time for our bathroom to have an overhaul. 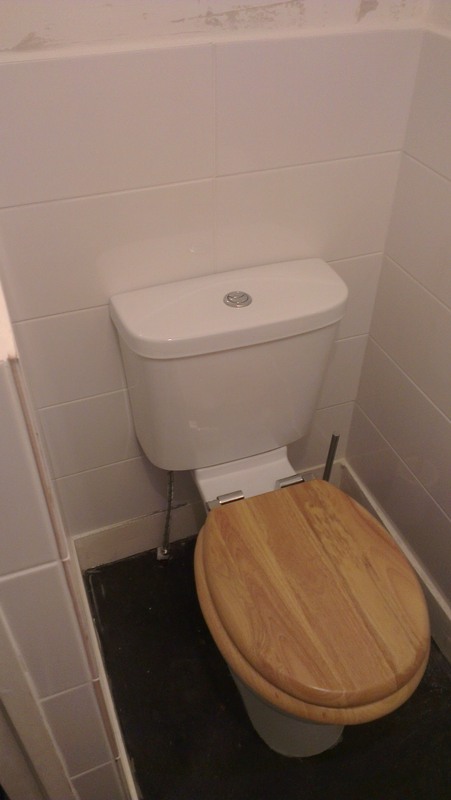 Whilst the plumbers are here, we thought we’d get them to sort out our under-the-stairs toilet too. 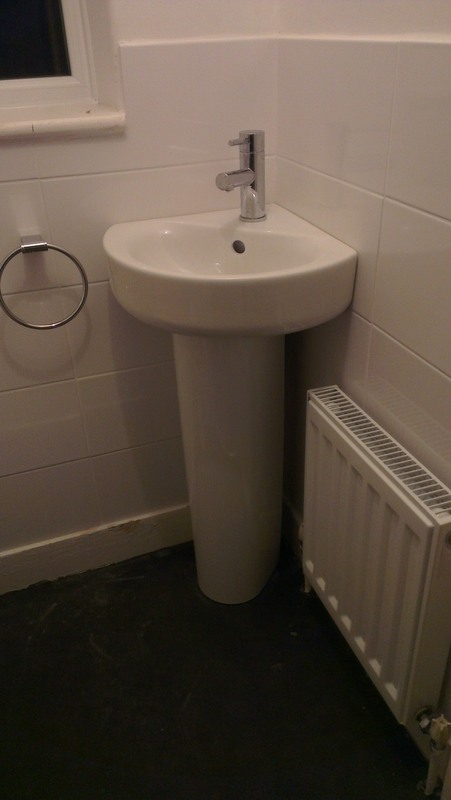 They have removed the avocado sink unit, hidden multiple pipes, re-tiled and installed a new radiator. It still needs painting and a new floor. In fact, I am even tempted to say the old cloakroom (which I stupidly forgot to take ‘before’ photos of) had more character. On reflection, I am delighted that the plastic pipes are no longer available for my children to stand on and that the tiles aren’t peeling paint. So now to make it nice. My husband’s grandparents used to have a cloakroom with amazing silver, gold and black flowery wallpaper. It was every bit as brilliant as it sounds. Whilst he is all for recreating this, I’m not entirely convinced. Having chatted about it, my brief was to find a wallpaper with a small pattern repeat (the room is tiny) with a strong visual identity. The simple, mid-century, monochrome pattern of Muscat Small in Black by MissPrint has clinched it, I think. Thirties frameless? Oak square? Gold rococo? I honestly can’t decide and no amount of ebay searching has come up with the goods. Yet. I’m not sure we’re monochrome people, really. It feels a bit too ordered. So I’m hoping to introduce a touch of mustard yellow to complement the wooden toilet seat and because it never fails to make me smile. Towel, definitely. Maybe a glass for toothbrushes. Perhaps a small picture.